It was the style and colors that first got my attention of the Pinup Girl Clothing Pinup Couture Nancy Dress in Blue Lemonade last summer with the aqua blue background pink lemons and white florals. The dress has so much attention to detail with adjustable straps, sweetheart neckline and a slightly padded bust with a ruched line down the middle to create definition and scalloped lace trim on the bust with a fabulous circle skirt complete with pockets. The Nancy is so dainty and feminine and I could not wait to slip my curves into it. I ordered the Pink Lemonade Nancy shortly after the blue and thought what a fabulous Easter/Spring dress it would be. The pink lemons and white florals are perfect. It was a bit chilly this Easter Sunday so I wore the Nancy dress with my Heart of Haute white Sweet Sweater and I think it works so well with the dress as it not only hugs your curves, ties into a pretty bow and adds a layer of warmth. I wear the Nancy in a size 2X to fit my well-endowed bosom. The waist is very very roomy in the 2X but, I find that adding a cute skinny belt or the Sweet Sweater make the dress incredibly figure flattering. The Nancy does have quite a bit length and that is actually something I really like as finding a longer dress is not always easy and, I think it is incredibly ladylike. I wear the Nancy dress with a striking pair of high heels and I couldn’t feel prettier or feminine. I add a nice fluffy petticoat underneath and I am ready to twirl!! I receive so many compliments too!! 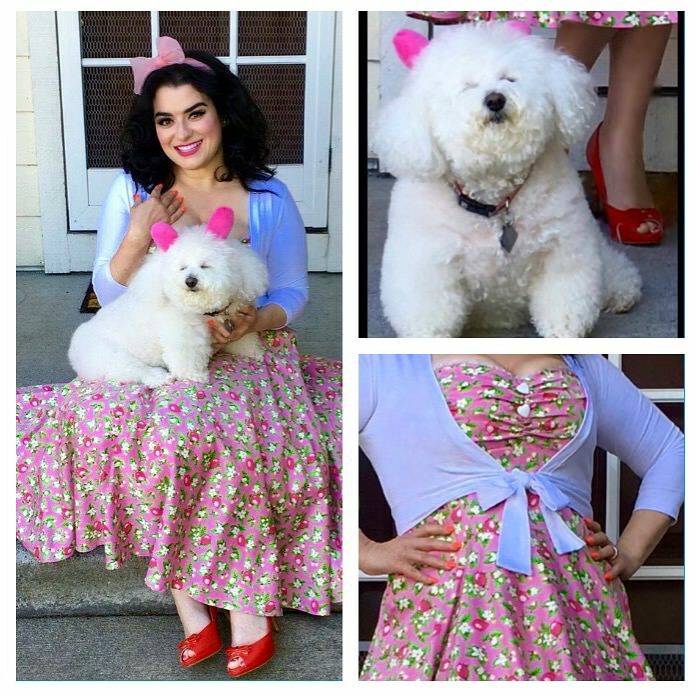 My Bichon Frise Luna was my puppy bunny and posed so nicely for a Easter picture with me. Hope you all had a great Easter holiday.